What do you think when you hear “Algae Scrubber”? If you would have asked me a about 6 months ago I would have said some antiquated way people used to filter their tanks that turned their tanks piss yellow. One day after I was reading around I stumbled across Algaescrubber.net, I started reading and reading, and thought hey this is a viable way to filter a tank as well as help remove unwanted nuisance algaes. Before I get into the new way of scrubbing, let’s take a look at how they used to do it in the past. Before, these screens of roughed up plastic, were set over a large flat area, which has water run over it, filling up and eventually emptying out, all while being bombarded with light. For all who are a little unsure of the process, below is a video about how they work (although a bit old). If you want to be lazy and not watch the entire video, fast forward to 4:25 and watch a bit. Ok so now you must be asking yourself, how can I do something like this on my tank? I don’t want some huge system dumping water in my tank all the time. Other systems include hanging a huge screen above your tank where it drains eventually into your tank (causing a gazillion bubbles to go into the tank, not gonna work for my tank any way). Most of us in the reefing world have sumps, and here is where I implemented my scrubber. 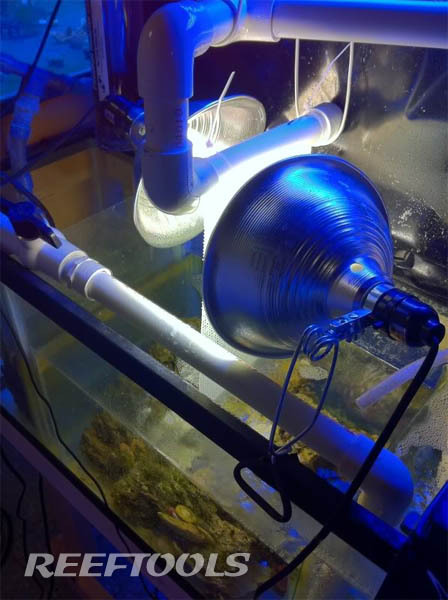 A simple pump on the bottom, pumping water up and through PVC pipe, which eventually drains out of a slotted piece of PVC, and down the screen which is lighted on both sides, into the sump. This is just one of many ways to get a scrubber attached to your system. Another scrubber style which is taking popularity lately is the scrubber box. This is a small acrylic box which has lighting on both sides, similar to the screen in the photo above, but contained to keep it cleaner and more efficient. It also promotes 3D growth in the sense that water accumulates just enough to get hair algae growing on the screen and provide great nutrient export as well as oxygenate the water (just as a side note, algae growing on the screen won’t make its way to your display tank). If you are thinking of setting on up, it isn’t as simple as grabbing a plastic screen and putting a light over it with some water. There are many factors. The size of screen one needs, would obviously depend on the size of tank. Ultimately a wider screen, is more efficient than a tall screen 1 square inch of screen per gallon of your DT. Lighting needs to be adequate enough to out compete the algaes in your DT (if you have any). Doesn’t need to be stronger, just the right spectrum aka 3000k ish bulbs. Finally the right amount of flow, 35gph per each inch of screen. If the numbers seem random, it is the formula that works best. If you want more information check out www.Algaescrubber.net. What a wonderfully simple solution to not having a refusium…Thanks for the great tip! !